Finishing a marathon is hard. Harder yet is committing to run it and training for it. So I felt like a winner before even lining up in the corral. But inevitably, one thinks about the experience differently once it’s over. 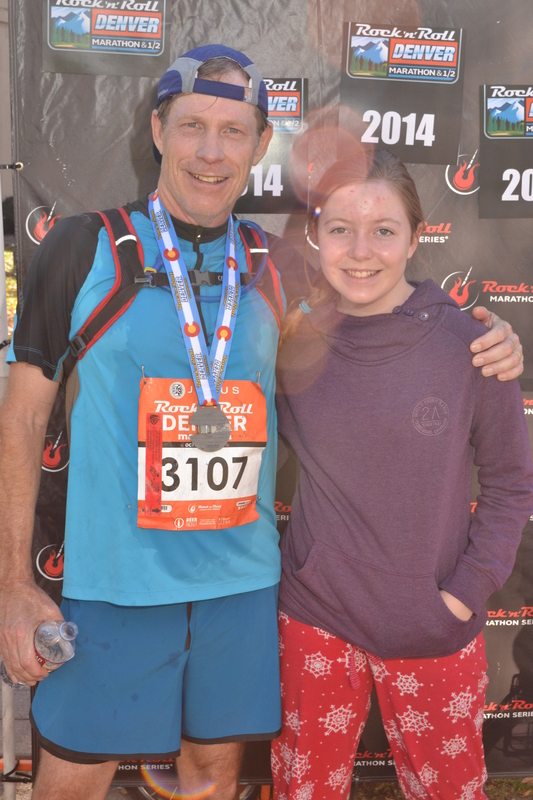 For the first time ever after a marathon, I ran the following day. Just three miles to loosen up, but I ran. This fall weather is too perfect not to run. I ran though because I could. My muscles have sufficiently recovered. Getting a post-race pedicure helped. That melted the strain from my feet and calves. A few times I’ve been able to walk the day following a marathon to work out the kinks. I’m mildly surprised though I was able to actually run. Typically, my only post marathon goal is to navigate the stairs. I’ve spent the last week analyzing my race. I’ve been racking my brain trying to determine where I could have run a minute faster to break 3:30. Not sure I could have run any faster. In fact, had I not changed my goal to try for 3:30, I’m certain I would have run a more enjoyable 5 to 10 minutes slower. I modified my strategy at the half way point to try for an 8 minute pace. I averaged a 7:50 up until then. Actually, I held a 7:50 through 17 miles. Then the wheels began to fall off. I ran mile 18, a downhill mile, slower than my previous uphill miles. I slowed down on mile 18 running down 17th Street after exhausting myself running three fast miles through City Park. I was seriously chasing down runners through the park trying to push myself. My pre-race plan was to make up time sprinting downhill on 17th Street. Hard to say what the smarter plan is now. I suspect pushing myself for 3 miles is better than running hard for 1 mile. I might have netted a half minute from that. If there is anywhere I could have run smarter, I probably should have run a bit slower on miles 8, 9, and 10. I planned to run these hard but really this is too early in a marathon. Next time, I’m going to run the first half as close to pace as possible. Then try for a negative split. Such plans will depend on the course elevation. I planned my Denver tactics on the elevation chart, but could have run the first half one or two minutes slower. I’m certain I could not have run faster the final 10K, because I tried. Mentally, I was motivated and gave it everything I had. 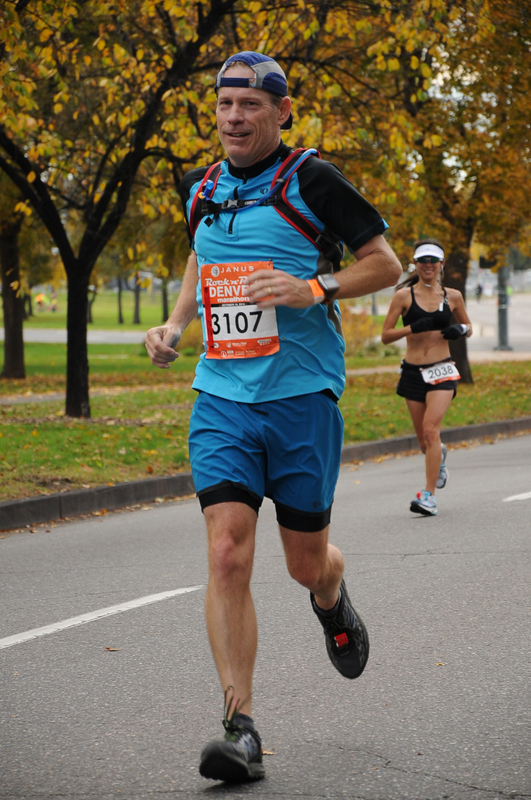 There was a point on Speer, in mile 20 or 21, where I tried to run faster. My heart rate shot up though, giving me a queasy feeling. After that, my legs were unresponsive. Similar to my three miles through City Park, I pushed myself through the two miles within Washington Park. Just like my slow downhill mile 18, mile 24 was downhill, but slower than the previous two. I think I gave it all I had. If I feel like breaking 3:30 is important, I’ll sign up for a race at sea level. And I take back what I wrote earlier about running 5 to 10 minutes slower being more enjoyable. I did enjoy a couple of miles in City Park where I pushed my pace. Not only was I passing other runners, but I found myself in a race with a couple of ladies, whom I passed for good. And another guy who took me two full miles to pass – at mile 17. He later passed me back for good at mile 22. That was less enjoyable because I was pushing myself then too. Ever been in a dream when you’re running, but in slow motion? It’s like your legs are asleep. That’s not unlike what it feels like after 20 miles. You’re not winded – because you’re running so slow – yet you can’t seem to get a response out of your legs. It’s fairly frustrating. Still, I met all my pre-race goals. Even though I could no longer accelerate after 20 miles, I felt comfortable and never actually bonked. And I didn’t cramp. Having the energy to maintain a relatively stable pace in the 4th quarter, and not cramping, are somewhat similar goals. I consider them separate though. One goal is about managing fuel, the other is more specific on electrolytes. I maybe should have consumed more Skratch in the final 6 miles. I only drank a total 20 ounces over the three and a half hour run. That seems light. But really, it didn’t warm up until Washington Park. Overall, I did most things right. As good as I’ve ever run a marathon. 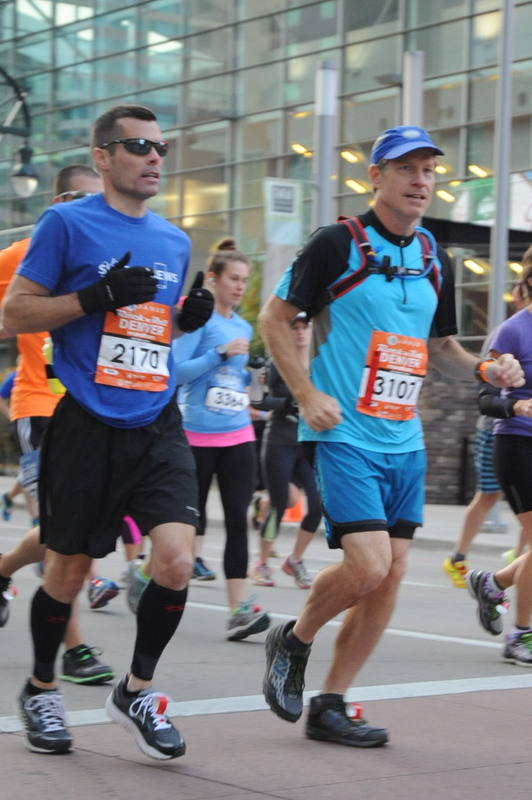 First time I ever ran parts of a marathon with a buddy, that was fun. 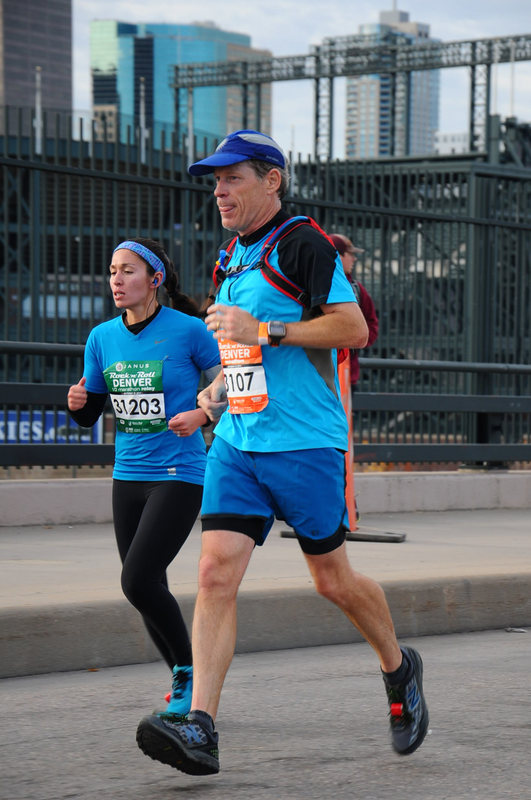 This is me running alongside Chris at mile 12. 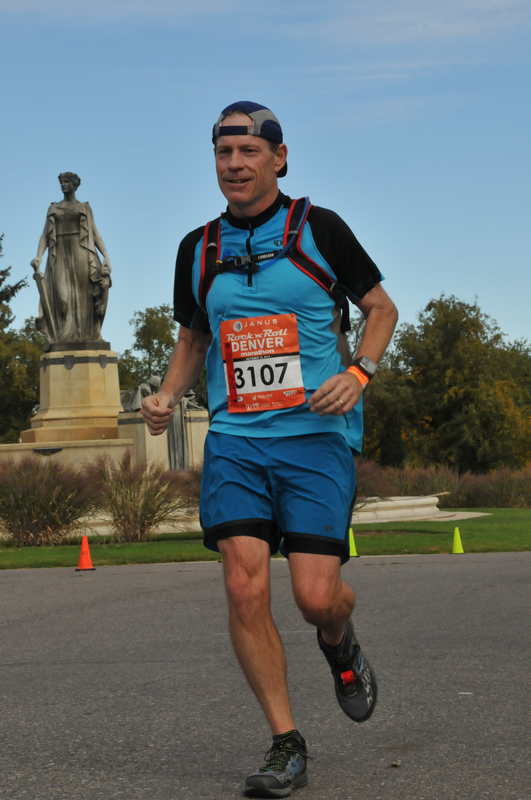 And technically, I did break 3:30 for 26.2 miles – by about 30 seconds. Problem is, actual distances are farther in a real race. I ran a total of 26.42 miles. Moving on, I should probably consider another run soon while I’m still in shape. Maybe the Longmont Turkey Trot in November? I was gonna say that you should come run here, but the last Marathon for a while was on the same day as yours. There is this: http://www.bataanmarch.com/default.htm in March that I might be at. I probably won’t be running…at least not the whole way, but it sounds interesting.